A year after brother vs. brother, The Undertaker had moved on to recoil with Paul Bearer. The Undertaker was buried alive by Stone Cold Steve Austin and upon his return, he created a faction of darkness known as The Ministry. The Ministry had tormented the McMahon family for weeks on end, until their attention was turned directly to The Big Bossman because of his involvement and protection of the McMahons. The character of The Undertaker had changed drastically and mind games were not enough to satisfy the darkness. The Undertaker had developed a much more brutal sense of destruction and he took to great beatdowns, crucifixions and other vile actions. At Wrestlemania XV, The Undertaker would step into the ring with The Bossman, but the brutality would become grander because for the first time in Wrestlemania history. Philadelphia would see the first Hell in a Cell match at Wrestlemania. 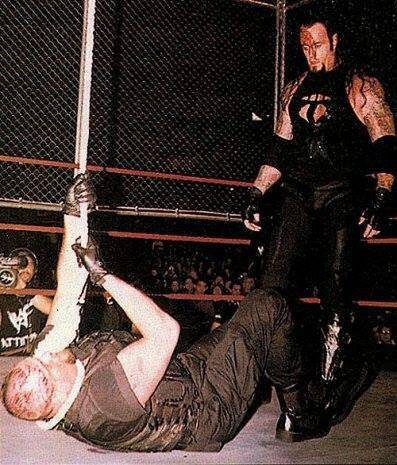 The issue and concern in this match as The Undertaker walked down the aisle at The First Union Center was what The Lord of Darkness had been doing in recent weeks and what he had done to Mankind the last time he was in The Cell. The Bossman awaited The Deadman in the ring and under the steel, fully unaware of how much danger he was in. The two men stepped into The Cell and the door was immediately locked. The match had some anticipation of what The Undertaker was going to do to the Bossman. I don’t think anyone could have predicted how far The Undertaker would go. The action began with The Undertaker swinging for the fences, but the Bossman gained the early upper hand to beat on Taker in the corner. Bossman wanted to set the tone early with physicality and a lack of fear against The Deadman. He would need the former because The Undertaker reversed Bossman, threw him into the corner and the best striker in the history of WWF went to work. He landed several devastating blows to The Bossman. The Lord of Darkness threw and distributed pain to Bossman until he was able to reverse The Undertaker into a swinging neckbreaker. Bossman would use the opportunity to attempt to ground The Undertaker, but his taunting got the better of him as The Undertaker overpowered Bossman on the mat and went to pound on him profusely. 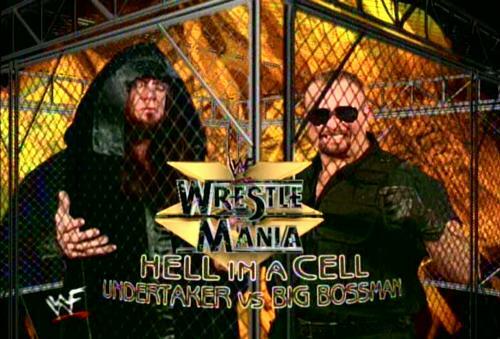 The two men found their way to the outside, where The Undertaker would use the steel to punish Bossman. He continued to push the back of The Bossman into the steel until The Bossman answered back, and utilized handcuffs as brass knuckles to turn the tide on The Undertaker. The Bossman handcuffed him to the side of The Cell and then found his handy dandy, night stick to blunder The Deadman with. The attack was very successful as it busted The Undertaker open, but had broken the handcuffs and freed The Undertaker. The Deadman regained control by utilizing The Cell once again onto the back of The Bossman. The damage had just begun. The Deadman swung a vicious chair shot to Bossman’s back. Taker used the momentum to ram Bossman’s head into the steel, release deadly strikes on him and then bring the fight back into the ring. The Bossman would try to get an offensive fury, but The Undertaker answered with a flying lariat. From there, The Undertaker went for Old School, but would be knocked on the ropes and off the apron and into the steel by Bossman. The men reentered the ring to trade bombs with one another until The Undertaker hit a blatant low blow and attempted the Tombstone. Bossman slid out of it and sent The Deadman across the room. The Undertakes ducked out of his way and successfully attempted a Tombstone Piledriver for his eighth victory at Wrestlemania. Yet, the deranged moment of the night for The Bossman came shortly after the ring tolled for him at Wrestlemania XV. The members of The Ministry climbed to the top of The Cell, cut a hole and released a noose. 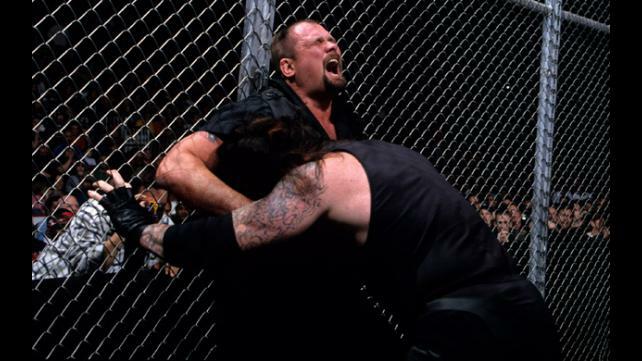 The Lord of Darkness added insult to supreme injury as he hung The Big Bossman from The Hell in a Cell to captivate the audience at the end of victory number eight. To be honest, this match wasn’t impressive, or anything special. I honestly look at it as just number eight. That isn’t a dig at The Bossman at all, may he ironically rest in peace. It is just with the rivalry, The Cell and The Undertaker at Wrestlemania, it would seem plausible for the match to be given an appropriate amount of time and have good storytelling inside the ring. Instead, it was a powerhouse attempt by The Bossman to conquer The Deadman and he was over matched in skill and in atmosphere. The match was simply and again ironically too big for him as a competitor at the time. The Undertaker was The Lord of Darkness and the head of The Ministry. He was too big at that point as a character to make people believe The Bossman had a chance to beat him. This is only heightened for me after the match The Undertaker and Kane had at Wrestlemania XIV and the fact that the powers that be were trying to build him up as the dominant heel in the company. It was challenging and a little unfair for The Bossman to carry a story that he wasn’t able to, along with The Undertaker ability to work inside The Cell and at Wrestlemania. It felt like a big match and then was a let down unfortunately for me. It was physical and it really would only continue the rivalry so overall nothing was accomplished in the ring, or in the story. For The Streak, it remains in history as number eight and in my opinion, that is all it is capable of being in The Undertaker’s history at Wrestlemania.